We traveled to Massachusetts a week ago for my cousin Erin’s wedding. Kristin, my Dad, and I flew to Boston on Friday, October 10, arriving late that afternoon. We met up with Erin’s Aunt Fran (we were her ride to and from the airport for the weekend), picked up the car, and headed to the hotel in Westford. We had to wait a bit for the car, but wound up with a loaded Impala… leather seats, satellite radio, etc. I wouldn’t want an Impala for my own car, but it was great for the weekend. That night we went to Scupper Jack’s for the rehearsal dinner. On Saturday, the three of us drove to Milford, CT, to visit the Eells-Stow House. 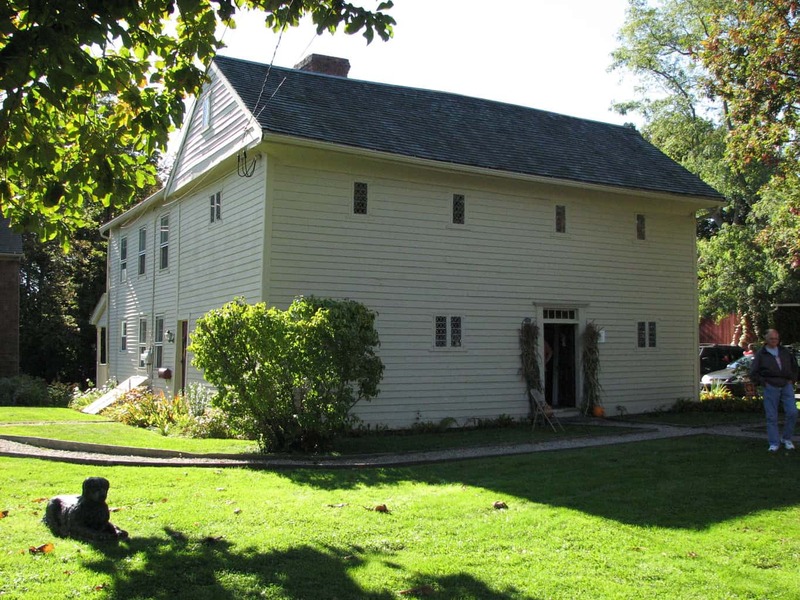 My 9th great-grandfather, Samuel Eells, owned the house (ca. 1700), and I’ve always wanted to visit. Didn’t know when we’ll get out to New England again, so this was my best opportunity. Since we were going to be driving through the Hartford area, I figured I’d give my 2nd cousin Jeff Ladewig a call and see if we could get together. Jeff is part of the Appleton branch of the Ladewig family, and lives in Connecticut now. He is an Assistant Professor in Political Science at University of Connecticut along with his wife Oksan. We had never met, but had exchanged email on and off. It turned out that they were going to New York on Saturday and would be going right by Milford, so we arranged to stop by the house in the morning on our way down, and then we’d meet up with them after lunch at the Eells-Stow House. Jeff was waiting outside on the porch as drive up, and we hit it off right away. Felt like we had known each other for a long time. Oksan had to take their son to a birthday party so we chatted with Jeff for 45 minutes or so before we hit the road. Once we reached Milford, the first order of business was lunch. If you’re ever in Milford, I recommend the Stonebridge Restaurant. Delicious! Then we were off to the house. We arrived to find that Jeff and his family had just arrived, so our timing was perfect. We all headed over to the house for our tour with Dave the docent. We explained the family connection and off we went. In one of the rooms they have a copy of a portrait of Samuel Eells. The original is in the National Gallery of Art in Washington (not on display however) which is itself a copy of an earlier portrait. 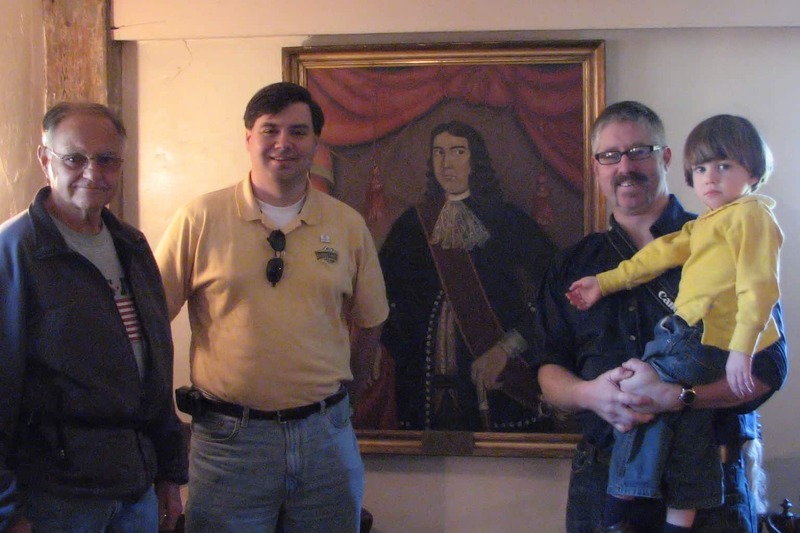 After we toured the house, we gathered for a photo with the portrait, three generations of Eells descendants. Front view of the Eells-Stow House. Scott’s dad, Darwin is off to the right. Three generations of Eells descendants with the portrait of Samuel Eells. It was quite an experience to stand in a house where one of my ancestors lived over 300 years ago, still in its original location. There aren’t many people who can say they’ve done that. There are two other historical houses that have been moved to the site, so we toured them as well before Jeff had to get back on the road to New York. We said our good byes and promised to keep in touch. After they left, we headed over to see the memorial at the Milford Cemetery to those who died from smallpox (including Capt. Stephen Stow) when the British released 200 sick American soldiers at Milford on New Year’s Eve 1776. Then we were back on the road for Westford. I’ll cover the rest of the trip shortly, but in the mean time, you can check out my photo album for the day.